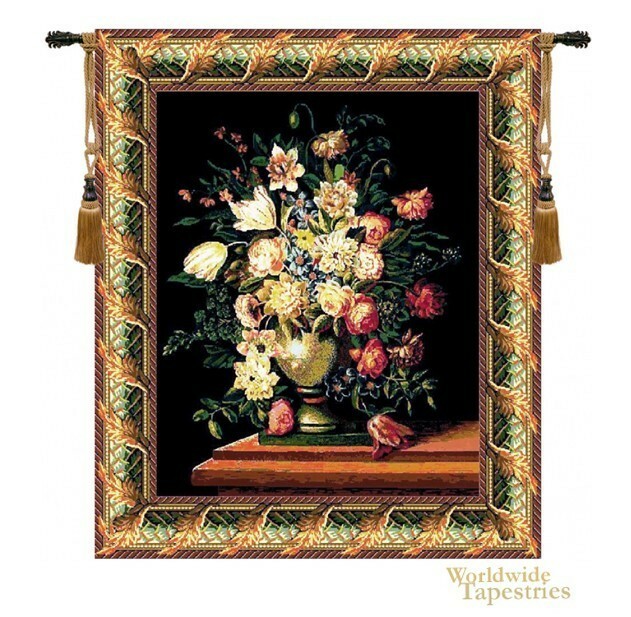 Breughel's Vase Black tapestry shows the work of floral artist Jan Breughel (1568-1625). An arrangement of tulips, roses and peonies in a vase on a table is seen and the colors stand out wonderfully against the black background. The yellows, oranges, red and blues blend harmoniously and contrast beautifully with the dark green foliage. An acanthus leaf motif border in bright green and gold completes the work. This Breughel's Vase Green tapestry is backed with lining and tunnel for easy hanging. Note: tapestry rod and tassels, where pictured, are purchased separately.